Just a few days ago Ashton Kutcher was being praised for resurrecting the Two and a Half Men franchise on CBS. Today, the heads of the corporation are mad with Kutcher for unapproved product placement. 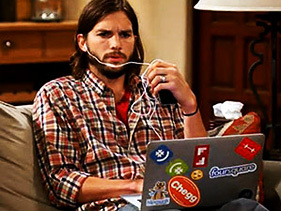 On the laptop of his character Walden Schmidt, Kutcher placed stickers for the companies Chegg, Foursquare, Hipmunk, GroupMe, and Flipboard. The actor reportedly invests in all of those companies and essentially gave them free prime time advertisement with millions watching. According to reports, CBS wants to be paid for the ads, even though the action is likely to be a move by Kutcher alone. For what it is worth, Kutcher’s character made his money on the Internet and all of the stickers were of popular websites that his character could supposedly have involvement with. Outside of the show, Kutcher and his wife Demi Moore are reportedly in the process of splitting up. Kutcher is said to have had an extramarital affair with another woman. In addition, Kutcher and Moore have spent less and less time together recently. Neither has spoken on the rumors. However, both have made Tweets that suggest their reactions to the rumors. Moore’s Tweets suggest that there might be some serious problems. Kutcher’s suggest that the rumors are false. Sooner or later, the truth will come out.